Taking the cupola of a Croatian mosque as its structuring device, The Last Performance [dot org] invites participants to contribute text for one of its many writing spaces, here termed "lenses" (the project will be complete with 4680 lens divided into six sectors, each a slice of the virtual dome). Participants respond in some fashion to one of four constraints or directives - e.g. "construct a last performance in the form of a heavy foot that weighs 2 tons and remains in good condition" - or to text already incorporated into the work; lenses then function as the raw (material) data for performance and algorithmic process alike. In some sense we might consider the lens as the current iteration of a hypertextual node or lexia, a limited though perhaps useful comparison prompted by the project's emphasis on architectural design and the material forms of text. 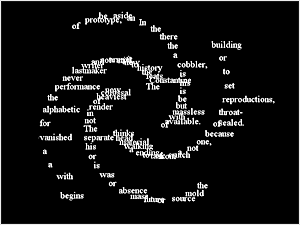 Author description: The Last Performance [dot org] is a constraint-based collaborative writing, archiving and text-visualization project responding to the theme of lastness in relation to architectural forms, acts of building, a final performance, and the interruption (that becomes the promise) of community. The visual architecture of The Last Performance [dot org] is based on research into "double buildings," a phrase used here to describe spaces that have housed multiple historical identities, with a specific concern for the Hagia Sophia and its varied functions of church, mosque, and museum. The project uses architectural forms as a contextual framework for collaborative authorship. Source texts submitted to the project become raw material for a constantly evolving textual landscape. Instructions: Follow navigational cues and explore. Throughout the site, there are prompts to join the project and contribute. Contributed texts are composed either in response to constraints (instructional or topical phrases intended to facilitate a collective writing practice) or in response to previously contributed texts. Writings submitted to the project are incorporated into the central architectural structure of the project, the dome. Please note that the contribution phase of the project will one day be complete as the dome is based on a finite architectural structure. For Windows users, Firefox is recommended. Internet Explorer versions 6 and below are not supported. Previous publication/additional credits: Launched in 2007, The Last Performance [dot org] was initiated in response to the work of the seminal Chicago-based performance collective, Goat Island, and their decision, after 20 years of practice, to create a last performance. The writing project and the final Goat Island performance, The Lastmaker, overlap significantly having evolved in parallel through shared generative constraints. The Last Performance [dot org] has also been extensively presented as a gallery installation and a performative reading both of which build upon the conceptual and structural principles of the project. Video footage included was shot and edited by Martin Arvebro.